In Angela Duckworth's New York Times bestselling book Grit: The Power of Passion and Perseverance, she offers a systematic approach to finding success that discards the antiquated concept being "gifted" and instead focuses on rewarding hard work and cultivating the GRIT to push through adversity. 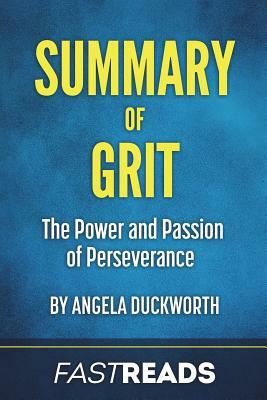 In her book Grit: The Power of Passion and Perseverance, author Angela Duckworth brings our attention to this lesser-known psychological trait called grit. Grit has two components: passion and perseverance. Passion means having enduring interest in the job you are doing. Perseverance means being persistent and never giving up. In the book, Duckworth shows how grit is important in understanding the psychology of achievement. BEFORE YOU BUY: The purpose of this FastReads Summary & Analysis is to help you decide if it's worth the time, money and effort reading the original book (if you haven't already). FastReads has pulled out the essence-but only to help you ascertain the value of the book for yourself. This analysis is meant as a supplement to, and not a replacement for, Grit.